I had a particularly good bunch of runs this week and looked forward to downloading my Sportband after this morning's workout. Today is the last day of January and I was curious to see how I did in total mileage compared to December. I started with 15 minutes of core exercise as a warm up and then ran 3.1 miles outside. It was 18 degrees and windy and I struggled through the whole run. Running is mostly fun but today it was work. There was no debate when I reached the crossroad where I could run another mile or just head for home. I had hoped the core work would have prepared me better but my legs felt heavy throughout the run. My running felt mechanical the whole way through and I was prepared for an abysmal pace. I was surprised to see that I ran 3.1 miles in about 29 minutes. 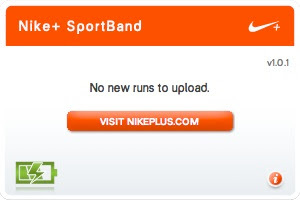 My frustration came when I attempted to upload the past week's runs to the Nike+ site only to see the dialog box read "No new runs to upload." I tried multiple times but the application just wouldn't recognize my runs. I ended up manually inputting the runs into MapMyRun where I aggregate all my workouts including training done on the elliptical machine. I looked on the Nike+ forums to see if there was a solution posted. There were no solutions but I saw that I wasn't the only one who was experiencing this issue. I finished January having run almost exactly the same total distance as in December averaging about 15 miles a week. Since I was on vacation for two weeks in December and had more time to run I'm considering January's distance a net gain. With the Sportband failing to upload my runs I'm thinking about bringing it back for a refund and getting a Garmin 50 with foot pod and HRM. I just can't rationalize spending over $400 for a Forerunner 405, Polar or Suunto GPS watch with the additional foot pod and HRM. My wife is having this same issue when it comes to uploading her runs. We're you ever able to find a solution? Please say yes, please say yes! posting a follow-up comment to track any responses, thanks! I solved the problem by buying a Garmin 50. I felt that the Nike+ system was too limiting and inconsistant. Sorry to hear that your wife has had the the same issue. I don't have that problem, my issue with the sport band is that it does not record the correct distance. If I do a 10k run it will tell me I have run under 5k!!! I've been playing with the Nike+ feature on my iPhone. The accuracy seems good - it was always the wristband that gave me trouble.